This is a short description of some of the work I have been doing with my own dogs, studying dogs and human emotions. The work has involved fellow therapists studying the relationship between our emotions and the dogs' behaviour. I had started to notice that my hounds were sensitive to my emotions. This first came to my attention when I was driving. I used to be a very nervous driver. When I was driving on the motorway and thinking about overtaking, my Hamiltonstövare Jack would stand up in the back of the car, as if looking for danger. After noticing this a few times I realised that he must be responding to how I was feeling. I started to wonder about the dogs' reactions to other people and whether they were reacting to how other people were feeling. One of the earliest experiences, before I started videoing sessions, was when my Labrador Archie, who I sometimes took to supervision, started licking the hand and arm of Terry, the supervisor. I was curious and at the next session I asked Terry about this. I was wondering whether Archie's behaviour could have been linked to Terry's feelings. Terry admitted that prior to our session something had happened that had annoyed him immensely and he had been aware that he was still holding onto that anger. It made me wonder. Was Archie sensing that 'stuck feeling' and trying to get it to move? So I started to pay a bit more attention. This work involves videoing 1:1 hour sessions that take place between myself and one other person and one or more of my dogs. To date, the other person has either been my counselling supervisor or another trained therapist (hypnotherapist, energy therapist, life coach). The important point about the other human in the session, and the reason for choosing therapists, is that we both have to be skilled in awareness of our feelings and emotions in the moment and be prepared to share them. In this way I have been able to gather information that can be used to analyse any different behaviour in the dog. Sessions have been held in either the supervisor's counselling rooms or in my own counselling rooms. So far, all the dogs involved have been one of my dogs, all males, two hounds and a Labrador. I try not to restrict their movement in the session, other than to keep them in the same room. From the work so far there appears to be a link between how people are feeling in the moment and how the dog is behaving. During one session I was talking about something from my past that brought up strong feelings for me. 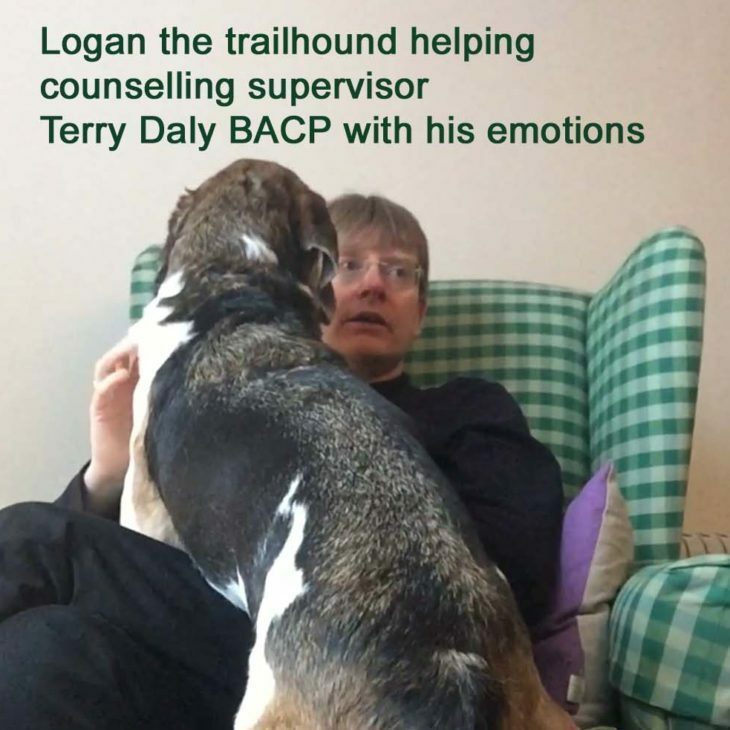 As these feelings started to come up my trail hound, Logan, who was quietly curled up on the floor, started to whine and stood up, getting restless. When I stopped trying to hold back the tears and allow myself to cry, Logan circled round and settled back down again. Shortly after, as the emotion subsided in me, Logan walked over to the supervisor Terry. He put his front paws on Terry's shoulders, and pushed his chest into Terry's chest. Terry came out of 'supervisor' role and talked about how he was feeling. He explained that he had been touched by the emotion that I had shown. He was holding onto it, in his own chest. This is a routine situation for counsellors in counselling sessions. If the counsellor experiences emotions during the session he or she will hold onto their own feelings, so that they can focus their attention on the client. Although Terry was sitting their quietly listening, Logan seemed to be reacting to the emotions he was holding onto. There have been other occasions when Terry has received a face or hand-licking. Often it has coincided with Terry holding onto some feeling in the moment. Other incidents, in my home with therapist friends, also seem to show a pattern. In particular, if Archie is licking someones's hand there is usually something they want to say that they are holding back on. I have also noticed that the dogs seem to be able to feel when you are thinking or talking about them...or maybe it's when you are worrying about them. My Labrador, in particular, takes a while to settle down, pacing the room with a cushion in his mouth. On one occasion he had eventually settled down and was lying quietly, with his back to me, while I was talking. Then I started speaking about my feelings for my dogs. My feelings tend to be around guilt and worry and 'must do better'. The exact moment I turned my attention to this subject he got up and started moving around the room again. I believe he was feeling the attention I had started to focus on him, as a pressure on him. At the beginning of a session with my supervisor, any of the dogs can take quite a while to settle down. To some extent it depends on the personality of the dog. It also seems to reflect how long it takes me to settle into the session. One time I felt really disorganised about what I wanted to explore. Jack, the Hamiltonstövare, was with me. He had been pacing the room and whining for much of the session. I had tried to ignore this at the time and he had eventually stopped. When I played the video back afterwards, I realised that he had relaxed just at the time when I had got into a flow with my own thoughts in the session. This is a brief summary of the observations and analyses I have completed to date. For me, they offer clear evidence that our dogs feel, and act on, what the people around them are feeling. I think it's an important line of study when so many us dog owners struggle with our dogs and look for ways to change their behaviour. I also think it's wonderful (and maybe a little threatening?! ), to realise that we have our very own emotional scanning device in our dog by our side.